When I heard about Joe Strummer’s death, I was climbing a mountain road in Vermont during a light snowstorm a few days before Christmas. That far north, most radio stations broadcast in French. Rolling through the static, I finally heard words in English telling me that Joe Strummer had died. Today, I heard about Lou Reed driving through a cloudless late morning in Los Angeles. The Velvet Underground will always be very important to me, but in my twenties they were a revelation. I had a big crush on Lou Reed for a long time. I went to see him at the Greek theatre on the eve of the Los Angeles riots. I saw him another time on the tour for the New York album. I passed on a free ticket to see him once in 2000 or so cause I had tickets to Elliot Smith. Since Elliot Smith killed himself a couple years later, I’m glad I saw him at least once. I loved every Velvet Underground record. 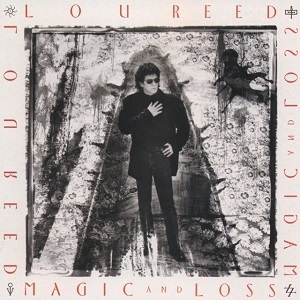 My favorite Lou Reed album was “The Blue Mask.” I really dug the crazy, beyond Oedipal madness of the title song. But one of his records that really got me through tough times was 1992’s “Magic and Loss.” Had there ever been a “grief rock” album before? Surely John Lennon’s Plastic Ono Band explored many forms of grief in harrowing songs like “Mother,” but I had never heard such a purposeful, focused two-sided exploration before. My brother had died in 1990, and sorting through the guilt and sorrow I felt took a long time. “Magic and Loss” wasn’t always easy listening, and I remember my boyfriend at the time finding descriptions of hospital beds less than conducive to romance. I feel gratitude to all the artists that helped me through. Too many to name. John Lennon’s death would take a book to tell. I learned of George Harrison’s death in the bleary light of November mountains. And Lou is a big one. But which losses push us to a sharper, more urgent appreciation of living and which ones make us fold? Is this our choice to make?